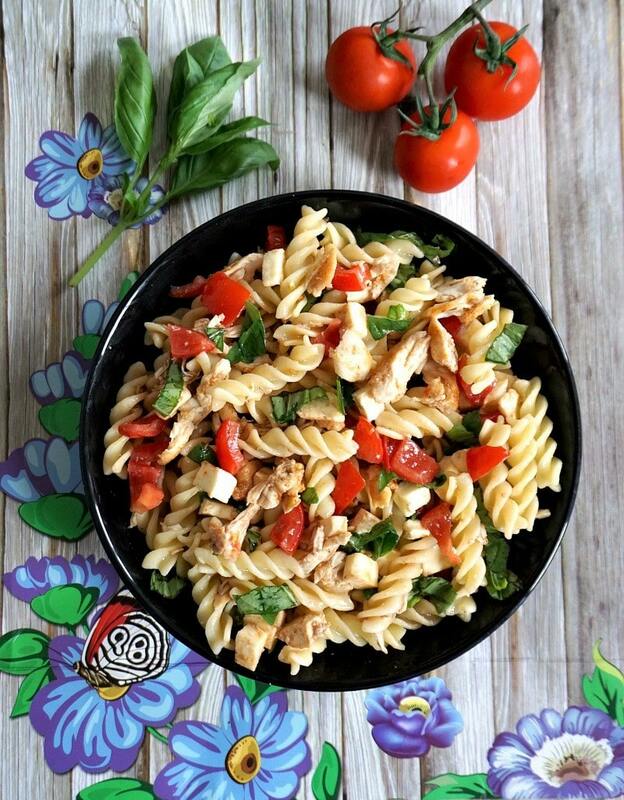 Cold Chicken Caprese Pasta Salad with an olive oil, basil and balsamic vinegar dressing, a satisfying recipe full of flavour and colour. I love pasta of any kind, but this chicken caprese pasta salad is a top notch one. Super easy to put together, and it can be enjoyed as a work lunch, quick dinner, picnic, back to school meal; you name it. 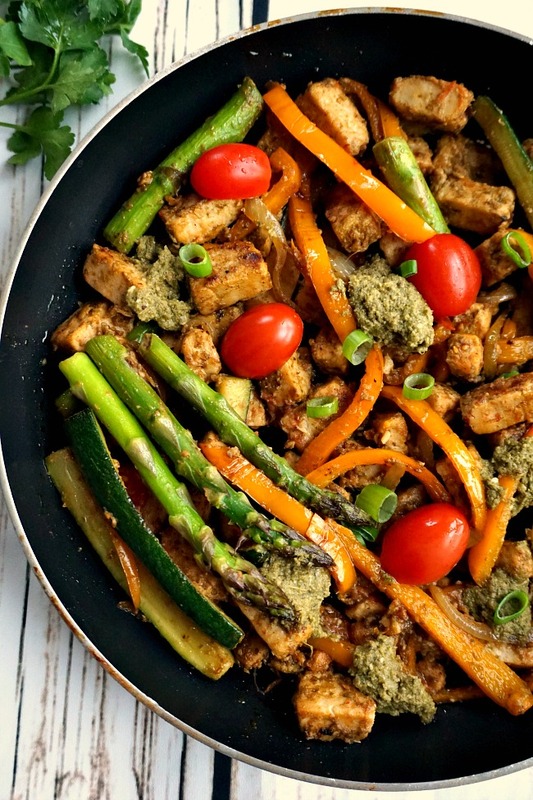 And, the best part is that is ready in under 30 minutes, which makes it the ideal meal when you are short of time, but still want to enjoy a nutritious meal. Pasta salads are great in summer time, when you’d rather go for a cold dish, rather than a hot one. But if simple salads are not your thing, this pasta salad ticks all the boxes. Caprese is a simple Italian salad makes of fresh mozzarella cheese, tomatoes and basil, seasoned with plenty of olive oil and salt. Balsamic vinegar is also a popular addition. You can make your salad as simple or as fancy, but adding ingredients you like, in order to make it more filling. 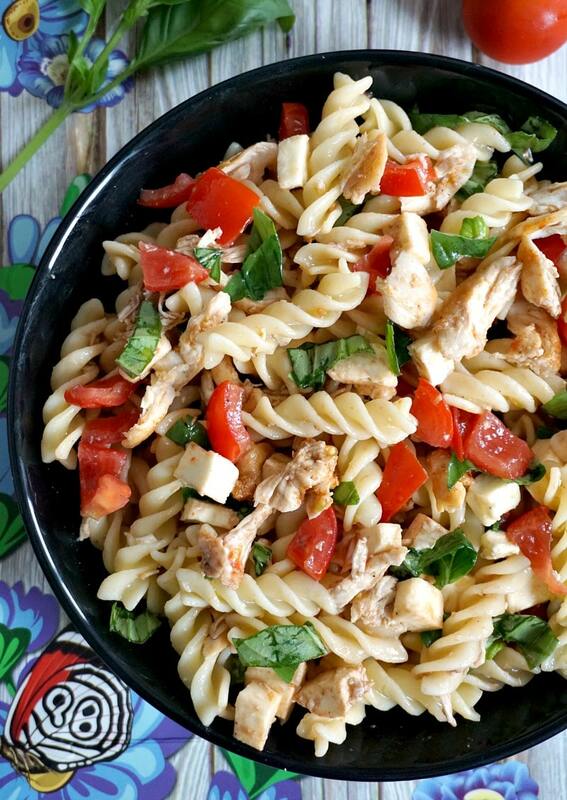 How do you make a chicken caprese pasta salad? Nothing simpler. First, cook the pasta of your choice according to the packet instructions. I used fusilli, but anything goes. Once cooked, drain the water, drizzle a splash of olive oil over, toss well, and set aside. To make the grilled chicken, cut up the chicken breast into small chunks, season well, then grill for about 3-4 minutes on a side until cooked through. Leave the chicken to cool, then add it to the pasta with chopped tomatoes and mozzarella cut into cubes. To make the dressing, mix together the olive oil, balsamic vinegar and chopped basil, and drizzle it over the salad. Season with salt and pepper to taste. How do you store the pasta salad? The salad is a lot nicer straight from the fridge, and it keeps well in an air-tight container. However, if the dressing has been already mixed with the salad, it’s better to consume it sooner rather than later. If you want to take it on a picnic or as a packed lunch, it’s better to keep the dressing in a separate container until it’s needed. I have cooked the chicken on the grill, but leftover chicken is also a good option. Fresh basil has a lot more aroma, but if you happen to have only the dry basil that can also be used. Tomatoes can be of any kind or shape, cherry tomatoes, plum tomatoes, or the regular-size tomatoes cut into cubes. And that’s pretty much it, a fantastic salad to feed a hungry crowd. 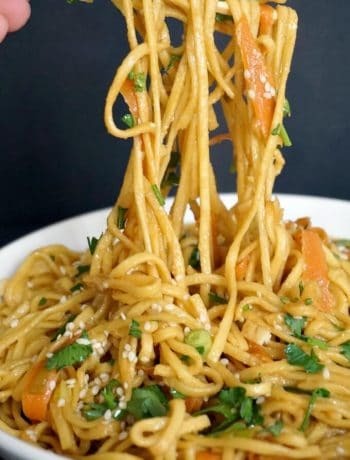 I just love a simple tasty recipe that actually looks nice enough to give the impression it took effort and time to make it. What kind of salad do you like? Are you a pasta salad fan? How about my Salmon Pasta Salad? 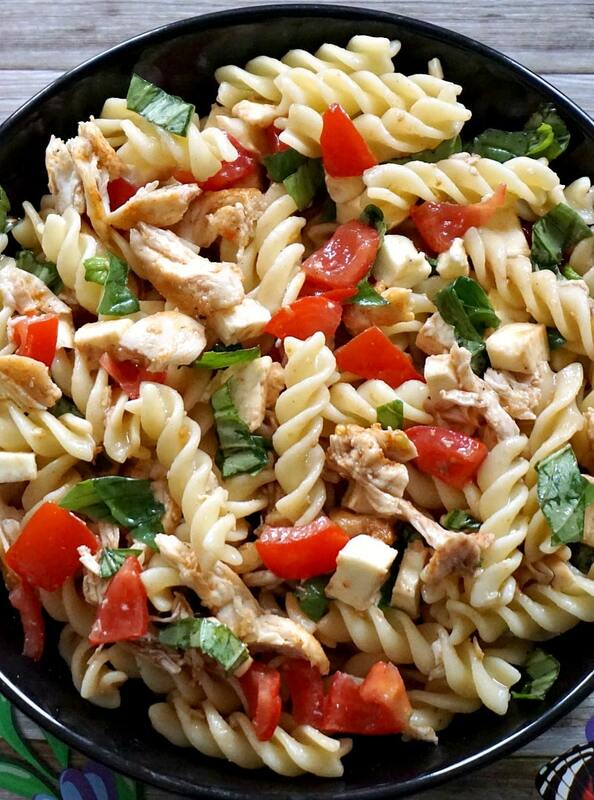 If you’ve tried my COLD CHICKEN CAPRESE PASTA SALAD or any other recipe on the blog then don’t forget to rate the recipe and let me know how you got on in the comments below, I love hearing from you! 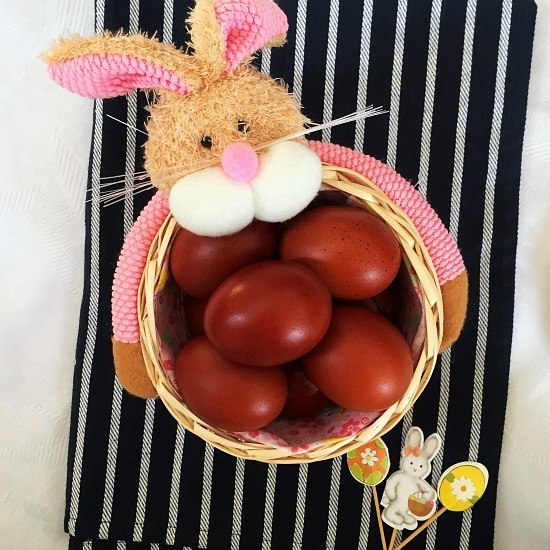 You can also FOLLOW ME on FACEBOOK, INSTAGRAM and PINTEREST to see more delicious food and what I’m getting up to. 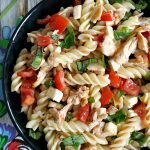 Cold Chicken Caprese Pasta Salad recipe with olive oil, balsamic vinegar and basil dressing, a fantastic salad to be enjoyed as a work lunch or quick easy dinner. Also great to take on a picnic. Filling, tasty and super easy to make. Bring a pan of salted water to a boil and cook the pasta according to the package instructions. When ready, drain the water and set aside to cool. Chop the tomatoes and add them to a bowl together with the cubed mozzarella cheese. Cut the chicken into cubes, add them to a re-sealable bag together with the vegetable oil, salt and pepper. Shake the bag well to coat the chicken, then heat up a grill pan and cook the chicken for about 3-4 minutes on each side until lightly brown and cooked through. Mix the chicken pieces with the cooked pasta, tomatoes and mozzarella. To make the dressing, combine the balsamic vinegar with the olive oil and chopped basil, then drizzle over the salad.